Metal Extractors for Vacuum Conveyor Systems – Foremost Machine Builders, Inc.
We offer three types of metal extraction devices that can be categorized in terms of performance or sensitivity levels: 1) an analog or standard metal extractor sensitive enough to detect metals parts starting at 0.5 mm, 2) a digital metal extractor for the removal of metal parts at a higher level of sensitivity starting at 0.4 mm, and 3) a digital metal extractor that can achieve levels of sensitivity starting at 0.3 mm due to a new powerful digital interference suppression capability that prevents environmental conditions from disturbing the metal detection process. Our standard analog metal extractor is ideal for those plastic processing applications that require the removal of metal particles starting at the 0.5 mm range. This device, as well as the digital models, was designed to deal with the problem in most vacuum conveying systems. In most injection molding processes, for example, the speed of the granulate material in the suction vaccum lines is rarely consistent. Metal contamination is most likely to occur at those points where the speed of the granulate varies. 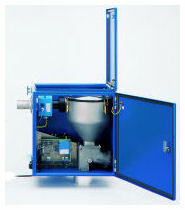 Our metal extraction devices reduce the effects of this variable speed using a special cyclone inside the housing. With this cyclone, you can reliably extract the metal depending on the speed of material and how long the material rotates in the cyclone. This means that you don’t have to adjust the distance between the ring and flap. All our extractors feature an ultra high sensitive control unit. If you require higher sensitivity, we recommend the M-Pulse electronic board. If you require higher levels of sensitivity, consider our digital metal extractor. Capable of sensitivity levels starting at 0.4 mm and a higher rate of reliability than its analog counterpart, the digital extractor uses a digital PC board and a different mode of operation. The new digital technology provides greater protection against metal contamination, is more reliable, and is more automated due to its multifunction panel. Instead of using a potentiometer like the standard analog extractor, this device has greater self monitoring capabilities and provides better protection against environmental conditions that can adversely affect the metal detection process. At the top of the metal detection scale, is the M-Pulse generation of metal extractors. To reach higher levels of sensitivity and reliability than standard analog and digital models, the M-Pulse units use a very powerful digital PC board. The M-Pulse unit is normally recommended for use in the food industry where the demand for great sensitivity is much higher. In the plastic industry, the demand can even be higher. For these reasons, more and more processors expect more than a standard metal detection solution. Since even the smallest metal particles can damage a food or plastic processing machine, most processors are looking to the new M-Pulse generation as a possible solution. With the highest levels of sensitivity on the market, and capable of being updated to keep up with the latest in software development, the M-Pulse units of fast becoming the metal detectors of choice.